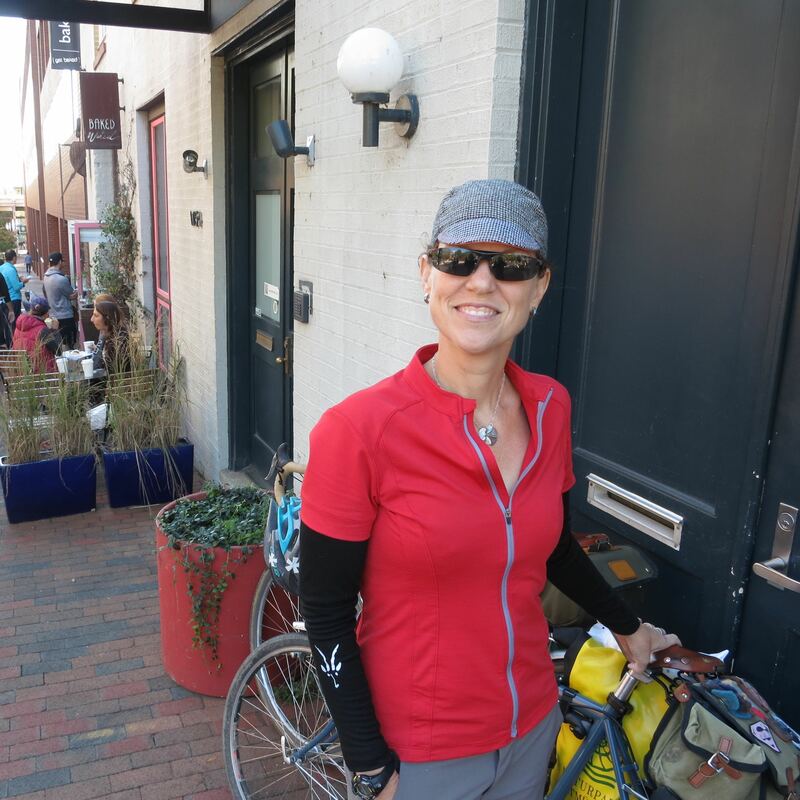 When I announced the list of 2014 Coffeeneuring Challenge Finishers, reader and original coffeeneur Vannevar asked me about my own coffeeneuring for the year. While I am a big fan of riding one’s bike in the pursuit of a good cup of coffee, there is at least one year where I did not officially complete the challenge. Too many rules! Busy weekends! Ran out of time! You know the excuses of which I speak. In those instances, I’ve quietly awarded myself an honorable mention. E for effort! This year, though, I’m pleased to announce that I followed all the rules and successfully crossed this year’s Coffeeneuring Challenge finish line. Below is my report for your review and enjoyment. This was the return leg of my Choose Your Own Eventure weekend. Felkerino and I toured back home on the C&O Towpath after spending the day running around the Harpers Ferry area of West Virginia. Beans in the Belfry is a popular spot for C&O cyclists. It’s a short diversion from the trail, offers tasty sandwiches, and the coffee isn’t terrible. The bike parking is acceptable, not great. While there is a bike rack somewhere, it is not easily accessed and most cyclists park their bikes alongside the building’s exterior. Beans and the Belfry coffee is no match for the smooth rich goodness at Baked and Wired, however, and Felkerino and I celebrated our weekend by slurping on Baked and Wired espresso as well as a slice of the irresistible pumpkin ginger loaf. Baked and Wired also has terrible bike parking. Most people end up parking to the gate that separates the sidewalk from the C&O Towpath. We threw our tandem on the roof and headed down to Harrisonburg to explore the area with our cycling friend Matt. The fall foliage was just past peak, but still quite lovely. 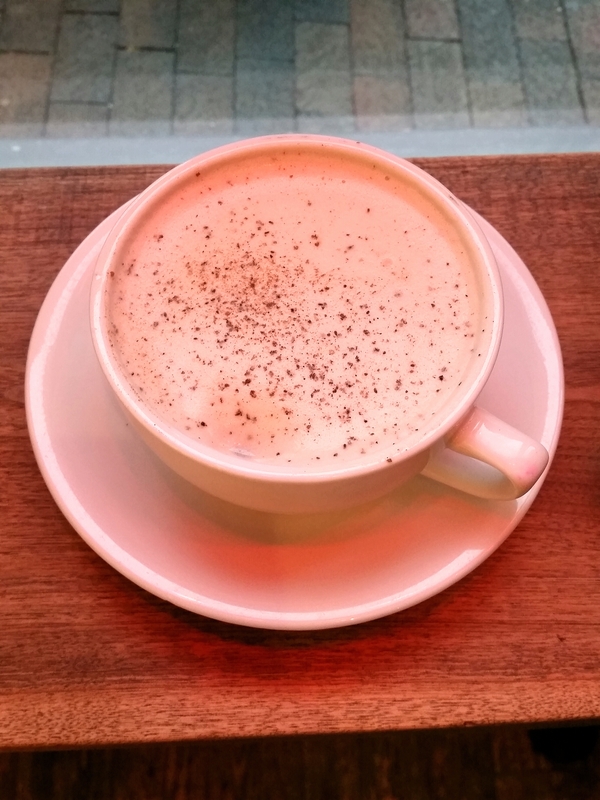 In the absence of a premier coffee shop in the downtown area, we checked out the tea shop. I remember my tea being tasty (I believe I ordered some kind of green blend), and Felkerino and I split a piece of cake, which was both tall and tasty. Bike parking? We didn’t see any so we leaned the bike over in the grass near the sidewalk. Before heading out to immerse ourselves in more fall colors, we stopped at The Little Grill for breakfast. 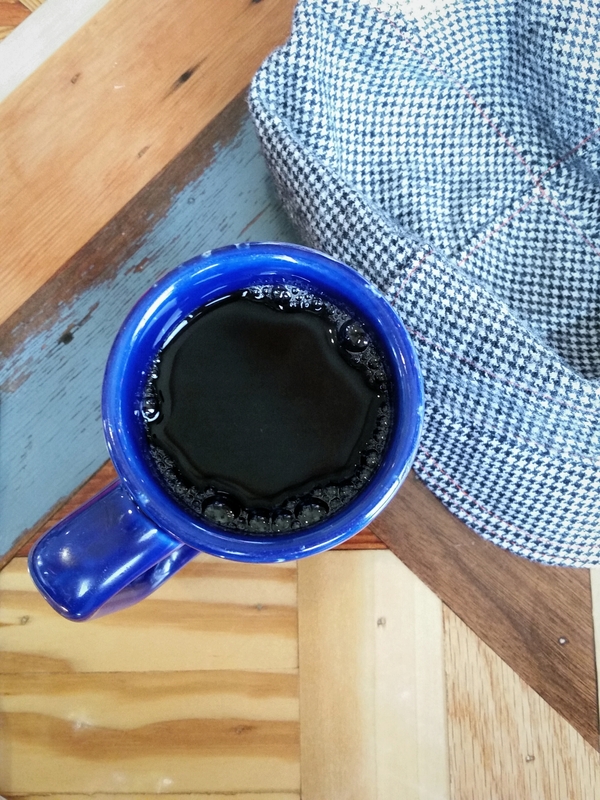 Felkerino has given up drip coffee for good, but I still enjoy the occasional drip coffee, provided it’s strong and fresh. The Little Grill did not disappoint. We dined on tables made by a randonneur in the area, so maybe that gave the coffee that little extra something special. Bike parking is plentiful at The Little Grill, and it’s easy to find a spot to lock a normal-sized bike (as compared to a tandem). 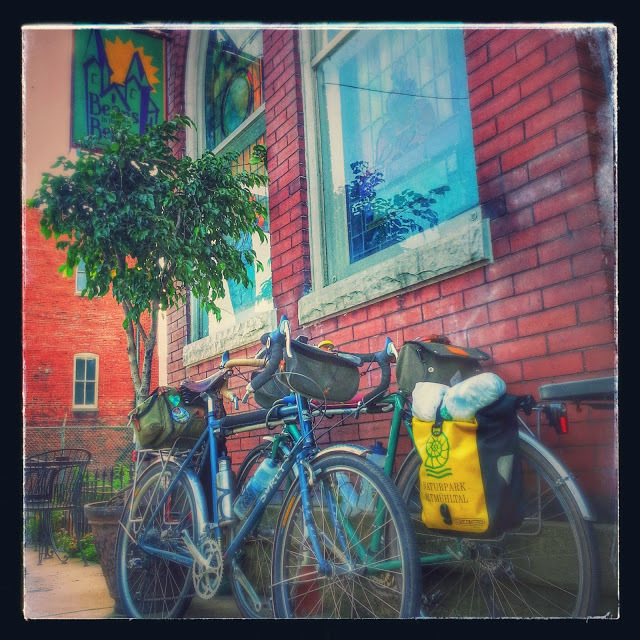 It was another weekend of throwing bikes on the roof (this time plural), as we planned a weekend of riding and bike ogling at the Philadelphia Bike Expo. 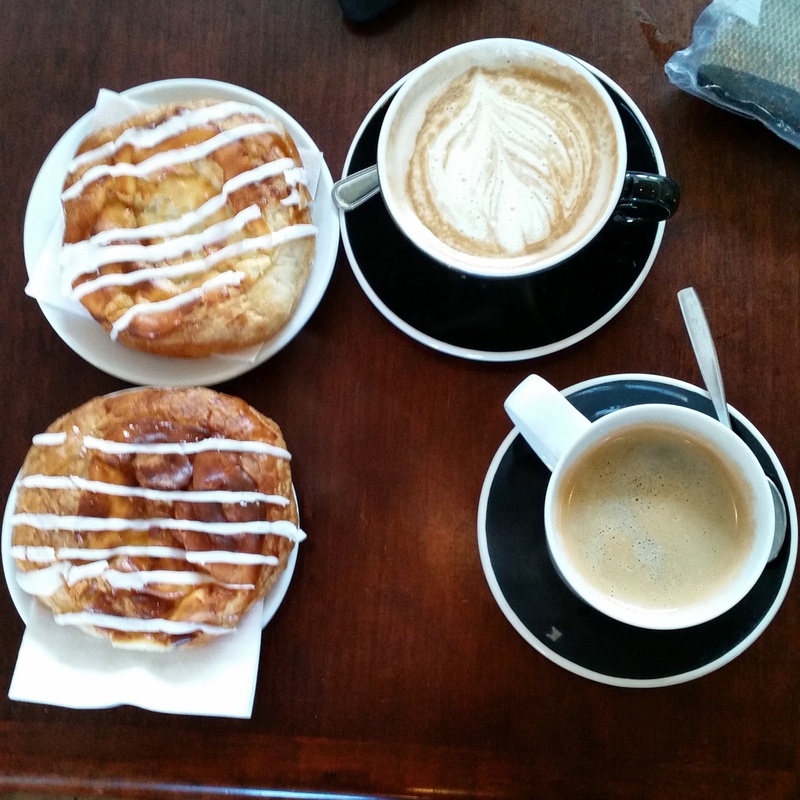 We rode our single bikes from a Philadelphia suburb over the Schuylkill River Trail to Volo Coffeehouse in Manayunk. Good coffee, sweet pastries, this shop is apparently a popular stop for the weekend group rides around the city. The bike parking here was alright. We ended up locking our bikes near some exterior tables where we could keep an eye on them from inside the shop. Every time I spell this shop’s name, I have to remind myself to remove the “i.” Tricky stuff. Felkerino and I visited Elixr last year around this time, and we were both looking forward to a return trip. In retrospect, it might have been nice to explore a new place, but it was early morning and I was not in the mood to take chances. 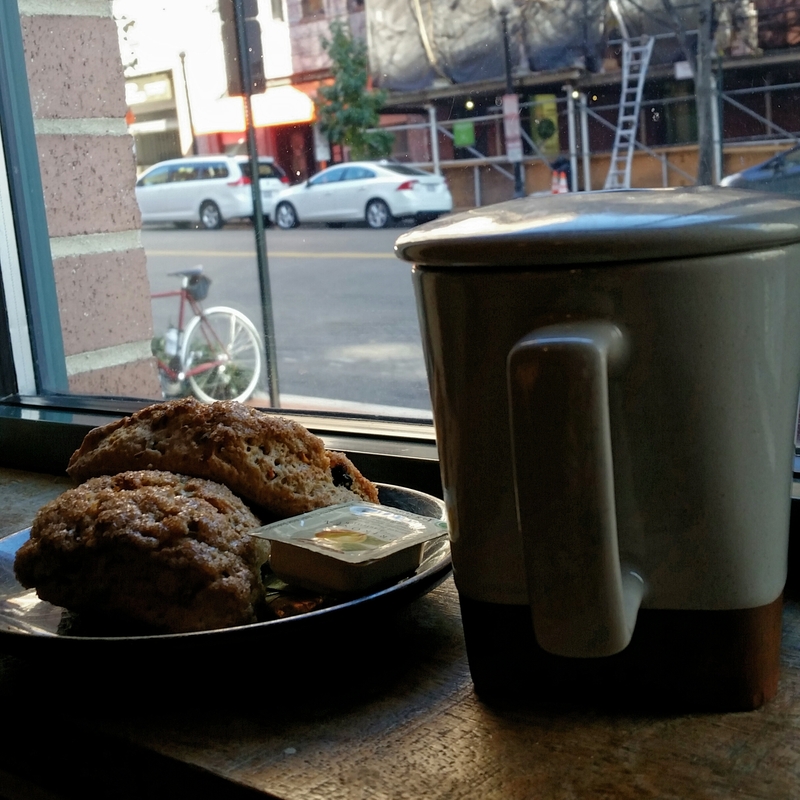 I drank an espresso as well as an Americano, and lined my stomach with a flavor-rich scone of some sort. Bike parking at Elixr? Lacking. As you can see from the photo, we stationed ourselves above our bikes so they were in view while we hung out. 14th Street NW. Washington, D.C. 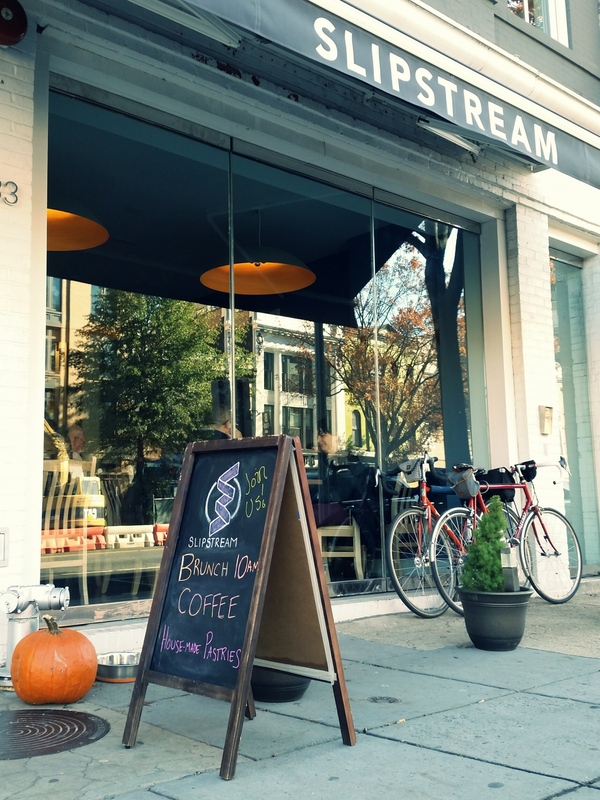 In the interest of trying something new, Felkerino and I headed up 14th Street to try out Slipstream coffee. This shop was a mixed bag, but ultimately I’d call it too much work for a cup of coffee. There was no bike parking outside the shop so we ended up leaning the bike against the large glass shop window. Inside, we sat down and ordered two espressos, and were asked what kind of espressos. Apparently we both ordered different types of espresso beans for our espressos, and they charged us $4 and $4.50 for them, respectively. ESPRESSOS! The drinks took a while to come, too long for people who haven’t had any coffee yet, and as we impatiently waited fellow BikeDC’er Andrew came in and told us that the secret was to order from the to-go station. 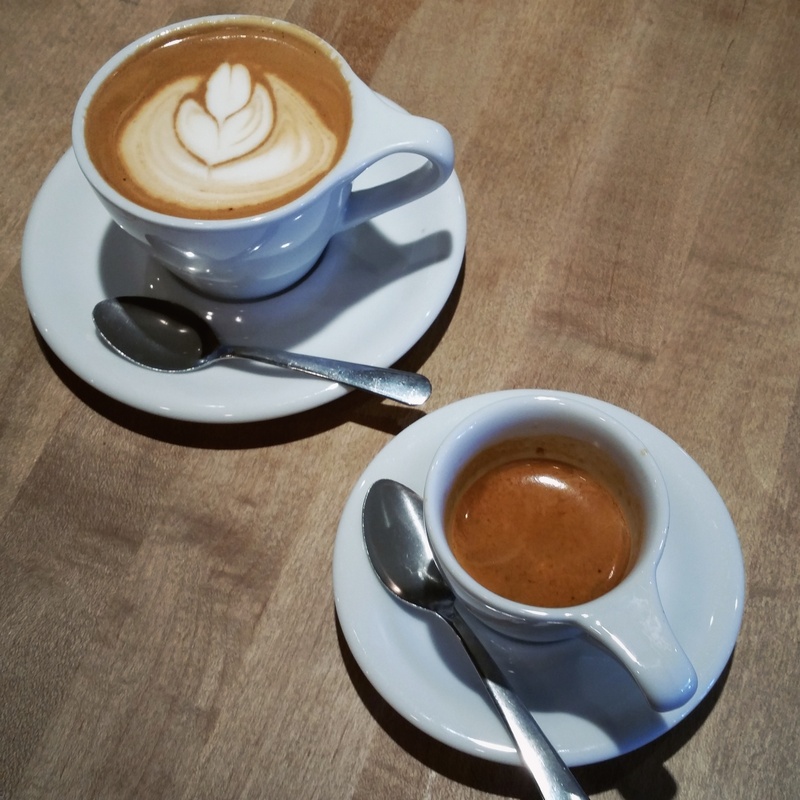 It also appeared that the espresso at the to-go station was less expensive, at least according to posted prices, which apparently do not apply throughout the restaurant. Too late for us, though, we’d already ordered from the bar. 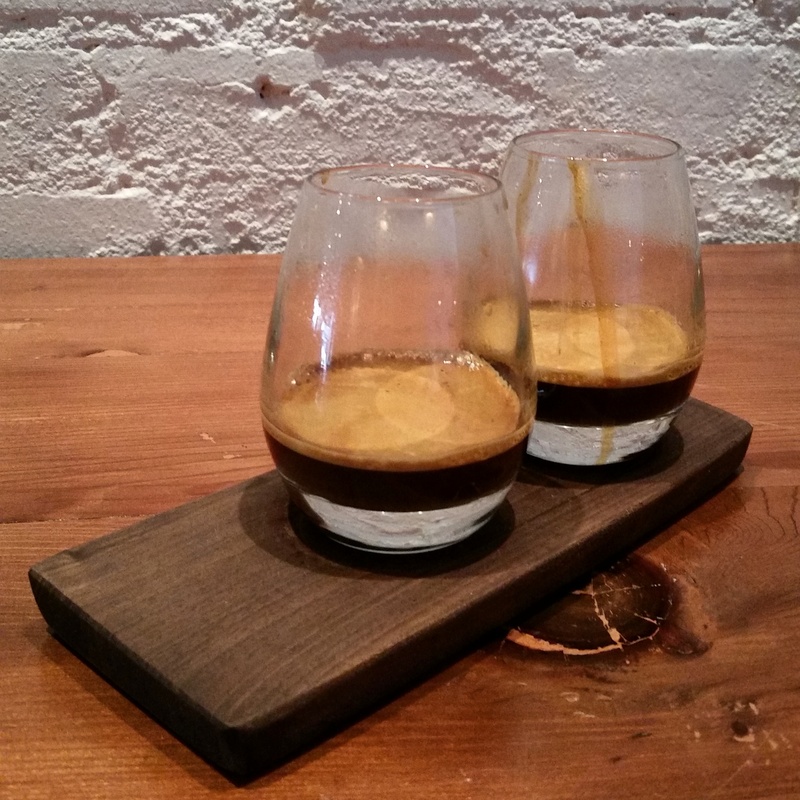 On an up note, the espresso was sublime, but I would sacrifice a little flavor for a less complicated (and less expensive) coffee experience. 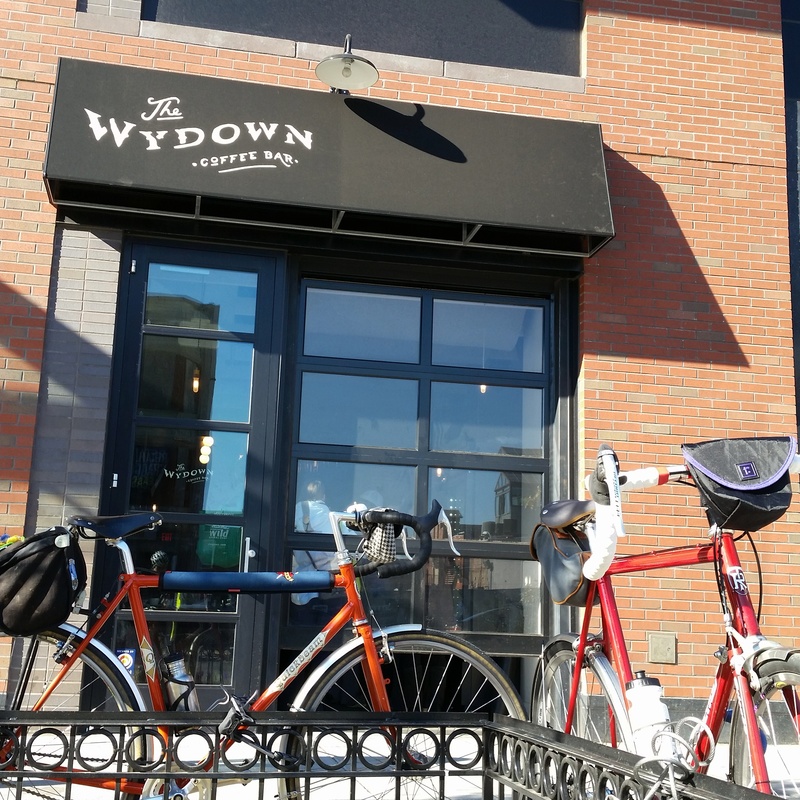 Left with mere pennies in our pockets, we left Slipstream and checked out The Wydown a bit farther north on 14th Street. I liked the vibe at The Wydown. It was hopping with activity. The Wydown appeared to draw in people from the Trader Joe’s next door as well as nearby residents, and the people working there were not messing around. No five types of espresso here, just a decent pull to get your day going in the right direction. There was some bike parking outside in the form of a couple of city racks, but we locked up to these short little garden gates that are found throughout the city. With an Abus Bordo, I can lock to those with ease. 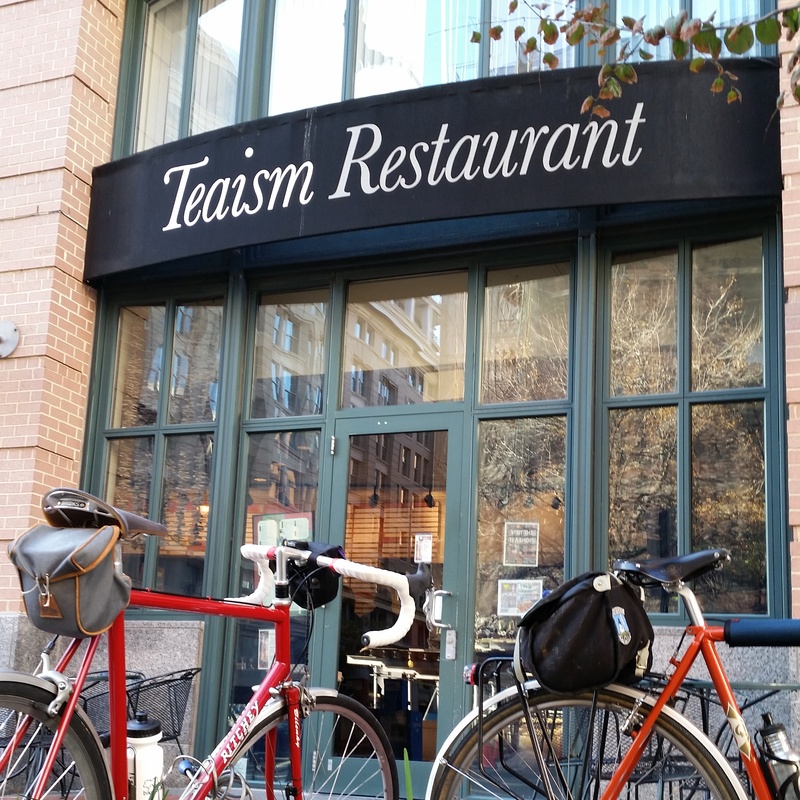 After The Wydown, we made a final stop at Teaism for lunch. Again, we locked our bikes to the short garden gates. There used to be decent bike parking here, but it has moved up the street and is not as good because it doesn’t allow a sightline to one’s bike. As an after-lunch treat, I ordered my preferred lavender mint herbal tea. So good. This is also where I met Eunice, of North Carolina, which I thought to be quite a nifty trick played by the universe on me. 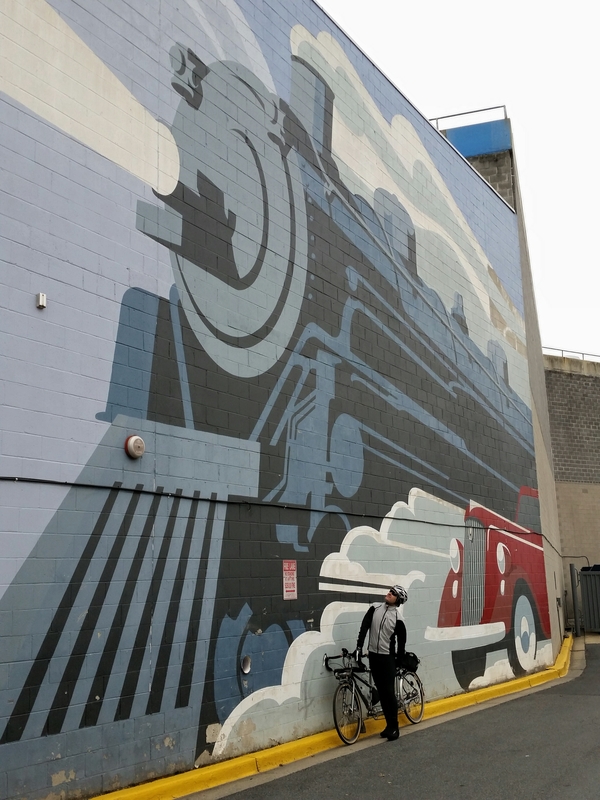 What better way to round out the coffeeneuring season than with an interstate coffeeneuring meetup? It was somewhat dreary in D.C. for the final day of coffeeneuring, but the absence of rain meant no excuses. 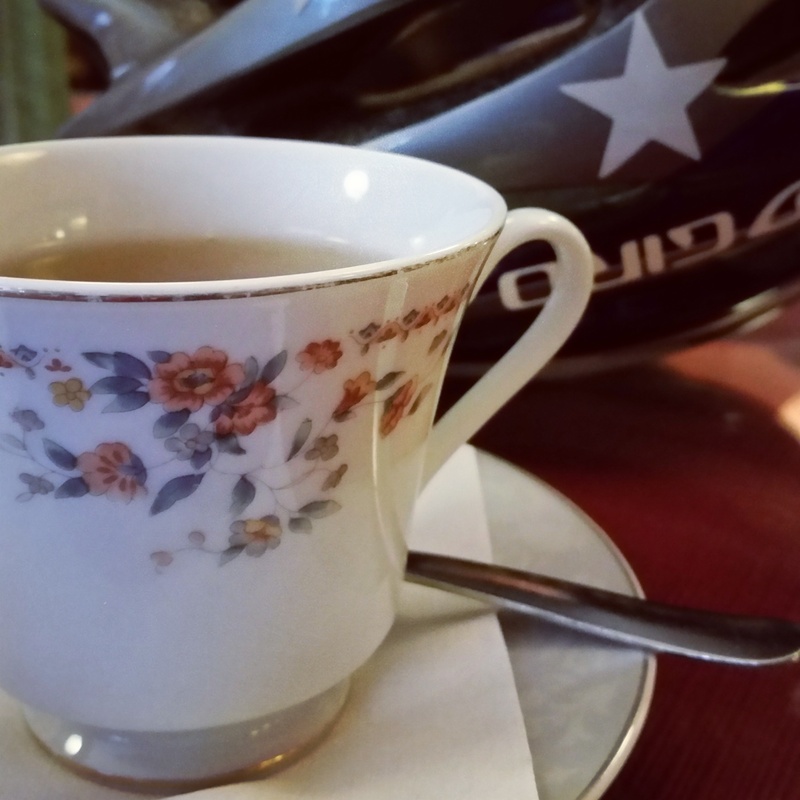 We meandered our way up to Bethesda for a bagel at the bagel place, and a hot cider at Quartermaine, the local Bethesda coffee shop and roaster that regularly draws cyclists. Bike parking is kind of tricky there– no bike racks, although the garden gates will do the trick, if you can find a free spot. My cider was tasty, and we drank our beverages while looking out at the mural you see pictured. 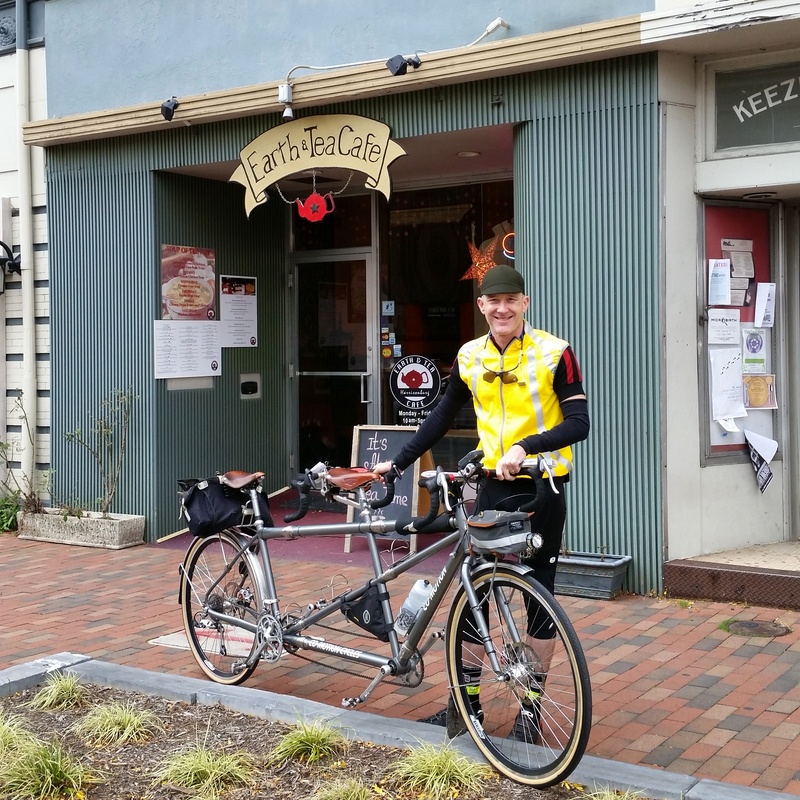 After our short Bethesda stop, we rode the Capital Crescent Trail back to Georgetown and to Baked and Wired for a final cup. Feeling pretty caffeinated, I chose a chai latte, and after I sucked it down I decided that I am not a chai latte person. Something about that drink is not fulfilling to my senses. It tasted like this picture looks– uninspired. I’ll stick to espresso, tea, or lattes, but not chai tea lattes. And there you have it. Coffeeneuring 2014. Seven different shops in seven weeks. Thanks to Felkerino for the fine company, and for picking up the tab on occasion (!). You’re alright, man. What fun. Thanks again for ram-rodding this coffee drive. I had a blast. I grew up in a big city, but for the last 18 years, have lived in a small southern town. Although I miss a lot of the big city stuff, including a wide variety of coffeeneuring destinations, I find it funny that you mention how easily you could lock up your bike(s) at every stop. 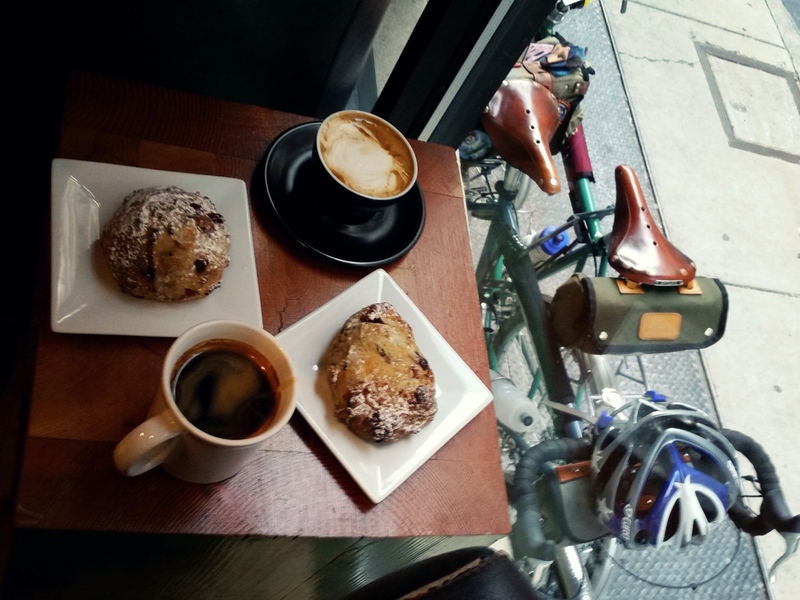 I completed my coffeeneuring series without ever bringing a lock. Never even worried about it. It’s one of the few advantages to living in Mayberry instead of Gotham City. Thanks for everything you do for us rule and caffeine obsessed riders. I think that probably is an advantage to living in a smaller place. Having grown up in a small place, I often think about the trade-offs that come with living in each.